Contributed by Leslie Nutbrown, Aug 17, 2008, last edited Aug 29, 2008 [lnutbrown@bell.net]. Total records = 337. If you are approaching Bury via Route 108 from Cookshire, turn onto Main Street and the cemetery is on your right behind Saint Rafa�l Catholic Church. Go up the steep church entrance and go around the back. This Catholic Cemetery dates from the 1860s with the earliest stone dated at 1867. 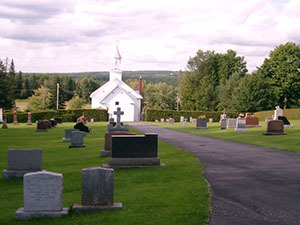 It contains both English Catholic and French Catholic graves. The cemetery is not difficult to walk and most headstones are legible. It is well maintained and has one paved drive, and a fence and gate. Susan Nutbrown and I walked and read this cemetery in August 2008 and made a complete recording of all legible monuments. Beauchemin, Adrien, d. 5 Nov 1913, age: 2y 3m, fils de J. B.
Donahue, Rose, d. 6 Apr 1890, age: 59y 8m 12d, wife of John Keenan Jr.
Harrison, Mary, d. 12 Oct 1884, age: 87y 9m 13d, wife of John Keenan Sr.
Keenan, John Jr., d. 20 Apr 1872, age: 45y, s/w John Sr.
Keenan, John Sr., d. 4 Apr 1867, s/w John Jr.
Lapointe, Unnamed, d. 22 Jan 1929, enfant de J.J. & E.
Leonard, Susan, d. 26 Mar 1898, age: 80y, s/w & wife of James Weir Sr.
Weir, May W. E., d. 12 Jun 1898, age: 9y 1m 7d, daughter of William & A.